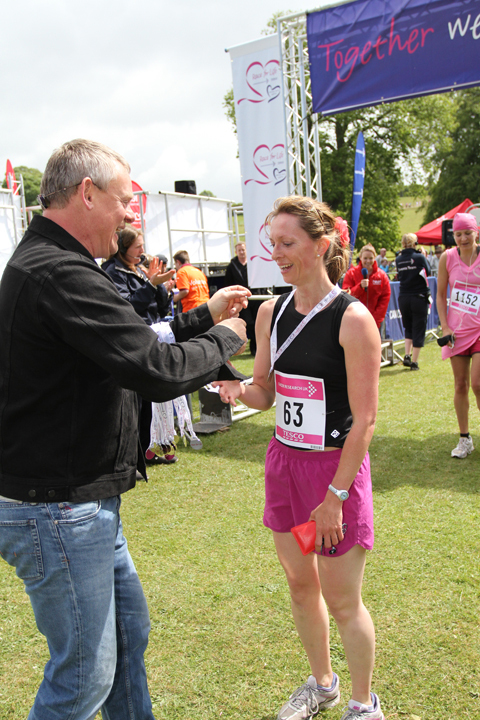 For the last five years I’ve taken part in the 5km Race for Life, four times at Kingston Maurward College (KMC), Dorchester and once at Sherborne Castle. 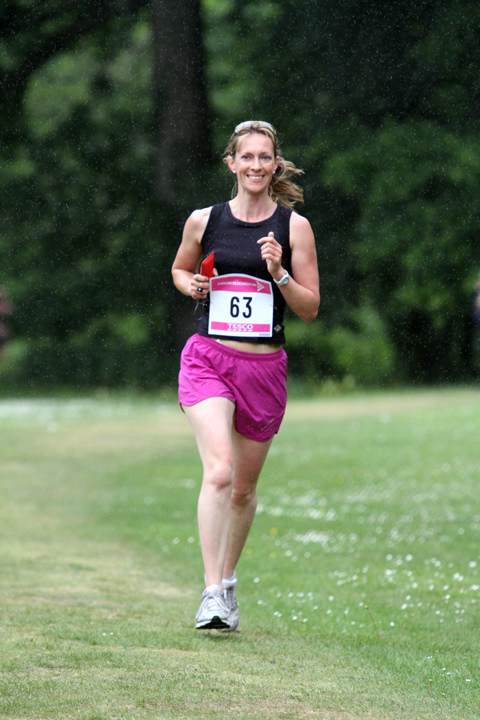 Race for Life is the largest women-only fundraising event in the UK. There’s always such a great vibe, it doesn’t matter what your age, size or fitness level any lady can get involved and either walk, jog or run the race – you can even take your dog! Theoretically it should just be about raising money for Cancer Research and having fun. Right? Well, I’ll let you into a secret – I have a very dominant competitive streak, which feels so wrong when it comes to charity, but there’s a switch which gets flicked when I’m at the start line. To be honest it starts with the warm up, I never over do the exercises as I want to conserve my energy and before the warm up has finished I’ve already edged into position near the start line. Over the last five years of Race for Life work colleagues have teased me about where I’m going to finish, as for the last four I’ve finished in the top 15 – which to be fair is pretty good, shows that I have a good fitness level and helps raise money for charity. For one Race for Life I’d finished the race and was home in the shower when a work colleague had just finished. For the 2011 race I’d done my usual preparation, a few 1.5 mile loops round the village, plus a couple of 3 mile runs the week before, so I was feeling pretty good. I also have a general all round fitness as I’m a bit of a sport billy – I ride (competitively), play tennis (for fun) and wind surf (learning). 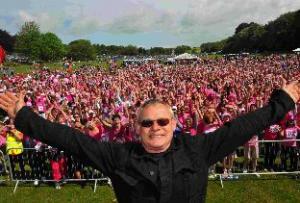 So as Martin Clunes (our local Dorset celeb) counted us down, I was in prime position on the starting line. And then, we were off… my friend and her boyf cheering me on and my Dad in prime viewing on the course. ﻿For the first 1km I seemed to edge into the lead, as the leader took a wrong turn out of a gate(!) and stretched into a rhythm up the first hill. For some bizarre reason I love running up hills, must be something to do with when we only had one horse in work and I used to run beside my mum and the horse trotting uphill – no wonder I got the nick name ‘my little pony’ during one Easter Hockey Festival! By kilometer 2 a few of the other speedy girls had caught me up and there was about 5 of us running together, the girl who had gone wrong at the gate then steamed on ahead with her feather boa leaving a trail of pink feathers all the way. Kilometer 3 was pretty flat and boring through a new field. My Run Keeper app piped up that I was 40 seconds under my 8 miles per hour target which came as a bit of a surprise but helped me dig in. Yes, there really were other runners! Kilometer 4 round the lake I could see 3 of the speedy girls about 100m in front – all with in reachable distance. So, as we turned for home on the last kilometer one of the stewards enthusiastically told us we were at the 19 minute mark. The 3 speedy girls were about 25-30m in front climbing up the last slope towards the College. My Dad was standing at the top of the slope and I knew he would secretly be willing me on. So, I dug in and at the top of the slope was level with the speedy’s and decided to stretch it out. I’m not sure where the inner strength came from as by now I had a stitch and my breathing was all over the place, but I managed to edge away from then. On the final 250m another speedy came from now where, and this is where the inner competitiveness came from… I wasn’t going to let her pip me over the finish line, not in front of all those people, so I moved up a gear and went for it…. and finished 2nd in 23.28, my best ever Race for Life position and time. I have of course run 5km faster – but that’s another story. I was also pretty chuffed to reach my Race for Life fundraising target and raised just under £80. You can still sponsor me at http://www.raceforlifesponsorme.org/beckwith81 And to anyone thinking of entering Race for Life – just do it, you won’t regret it!